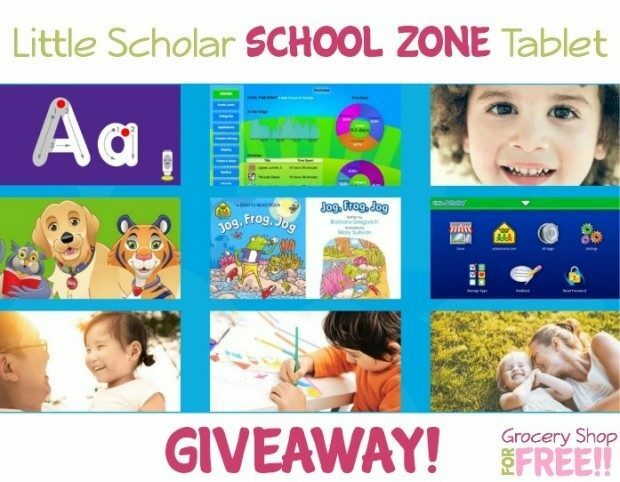 Little Scholar School Zone Android Tablet Giveaway! You are here: Home / Sponsored / Little Scholar School Zone Android Tablet Giveaway! Y’all I am so excited about this giveaway! We have looked at this with a fine tooth comb and we are thrilled with it and can’t wait to share it with y’all! One lucky reader will win their very own Little Scholar School Zone Android Tablet! It is a kid’s tablet, specifically for kids 3-7 years of age. I was expecting a kiddie tablet – but this thing is a full fledged tablet. We received one to check out and share with you! These apps can take them from learning their ABC’s all the way to Fractions! It’s awesome! The videos are very engaging – our 11 month old granddaughter loves them! Little Scholar Tablet (child mode) is certified by the kidSAFE® Seal Program. To learn more, visit www.kidsafeseal.com. This giveaway will end Saturday, February 27th, 2016 at 11:59 pm Central time and the winner will be emailed soon thereafter. Make sure you add [email protected] to your address book, so you get the email if you win! Hello! I hope my son will win this tablet. This can definitely help him with his speech delay. I’m so excited about this tablet for my son. Please!!! Please??? Arianna my 4yr old wants a working one so bad instead of her grandma’s shattered screen one. We’re homeless and I really have no way to get her one. Arianna’s birthday was last month and she had no party and no presents. Please consider us or cross your fingers and hope the luck of the draw is on our side. Thank you. I would like to win 2. One for each of my grand babies. This tablet has amazing features.. it would be perfect for any of my 5 nieces and nephews!! Would love to win this! Fabulous for our little one. I would love to win this for my 2 yr old. He is so advanced and gets bored very easy. This would keep him busy for hours. Thanks for this chance to win this great prize. I love that the tablet works with or without Wifi! I would like to win this for my granddaughters who I think will enjoy it together. I would love to win this for my niece & nephews! They would LOVE it! Thanks for the chance at this! This would be awesome with all the different kids I have received. 4 in the age range. I would love to win this for my only granddaughter! I would love to win this for my grandson! He would be so happy to have this and learn even so much more. Thank you for the opportunity and good luck to all! My son would love this. It would help him with apraxia and all. I would love this for my soon to be 4 yr old daughter. I love that this has so many pre installed apps! I love School Zone’s curriculum for my pre-k and 1st grader, it’s awesome to see that there is a children’s learning tablet that has it as well. It looks like so much fun, and of course a wonderful learning tool! My kids would love this!! My granddaughter would love this tablet! She sees her older brothers and sister using tablets, and wants to join in on the fun. I really like that this tablet is pre-loaded with educational apps that are age appropriate. Thanks for hosting this sweeps! I would absolutely love to win this for my little one!!! I would love to have this to use with the kids that we tutor that live in our apartment community. I manage a large Section 8 property and we have the kids come in every week for learning activities.